COME TO THE SATURDAY MOSAIC INSTALLATION WORKDAY. (2 short articles about the garden mosaic project) The usual masthead information is at the end. Both articles by Mary Mullen. Yes, it is supposed to be one of the hottest days of the summer on Saturday. That’s just the reason we need YOU to come up to the Marlborough Community Garden to help dig in the 32 numbered mosaic stones that will mark the beginning and end of each garden path. The more people, the less each one has to do. Wouldn’t it be great to have 64 people with their shovels, pick axes, and posthole diggers? In pairs could make short work of this project. Time: 10 a.m. - 12:30 pm - Arrive promptly to learn the details of how to set the stones. The job: digging holes 7 inches deep, laying in and leveling 4 inches of gravel and tamping it, laying in and leveling 1 inch of limestone fines and tamping, setting the stone, tamping dirt around the edges. The letter stones that spell out “Marlborough Community Garden” will be placed on another day or days, September 20 and 27. The strip of mosaics above the article are 7 of the 32 actual mosaics made in mid-July by gardeners and residents of the neighborhood. Marlborough Park shelter was abuzz with activity on Thursday night, July 17, and Saturday morning July 17. 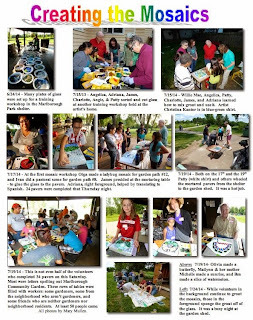 Kida and adults, gardeners, Dunn’s Marsh neighbors, and friends created 60 colorful mosaic stepping stones for Marlborough Community Garden. About 40 people came on July 17 and 50 on July 19. On July 24, more people lined up on both sides of 2 picnic tables to grout the foot-square stones. About 30 attended that day. Those who came together to create practical art for the garden represented a varitety of ethnic groups. Since the community garden has 65% Spanish speakers among its 100 families, Latinos made up a good share of the mosaic-makers, but those of European background also were a large contingent. As they say, a good time was had by all. The 3 workshops were led by community artist Christina Kantor. She had done a similar but smaller mosaic project for under the information bulletin board on Allied Drive at the corner of Jenewein Road. Volunteers who helped Christina lead the workshops included Micah Kloppenberg, formerly employed by the Community Action Coalition as a garden specialist (CAC is no longer invovled in the garden), James Luscher, gardener who was in charge of the mortaring table, Patty Stockdale, gardener who hauled a lot of pavers from the shelter to the garden shed, Angelica Muñoz, gardener who translated directions into Spanish, Charlotte Spors, gardener who did childcare, and Mary Mullen, gardener who flitted from place to place helping with whatever was necessary, keeping track of who did what, and taking photographs. This project is funded in part by a grant from the Madison Arts Commission, with additional funding from the Wisconsin Arts Board. Match funds for materials and supplies are funded from Marlborough Community Garden funds. 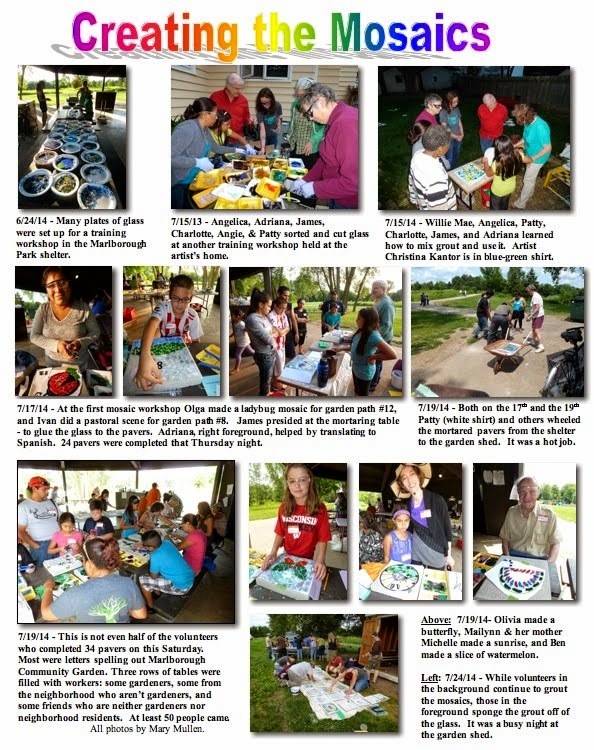 For a 1-page picture collage of the project, click on the attachment “pics creating the mosaics.” For a treasure trove of photos from each workshop, see the Dunn’s Marsh Neighborhood Association Facebook page. Go to Photos, then Albums. You’ll find these albums: Mosaic Grouting Workshop, The Second Stepping Stone Workshop, and The First Garden Stepping Stone Workshop. DM e-News - Election tomorrow!! Election info is first, then two brief notices. The usual masthead information is at the end. All articles by Mary Mullen unless noted otherwise. How Do I Know Whether I’m in Fitchburg or Madison? Primary election voting is on Tuesday, August 12. Polls open 7:00 a.m.-8:00 p.m.. If you are 18 (or older), a U.S. citizen, and have lived at your current address for 28 days or longer, you are eligible to vote. If you would like information about the candidates, the League of Women Voters has published cantidate answers at http://www.lwvdanecounty.org/. The on-line Candidates’ Answers has links to other resources such as the candidates’ webpages. Only some offices have two or more candidates on the Democratic Party primary ballot. The Democratic ballot choices are offered first in this newsletter because most voters at our neighborhood voting location vote Democratic - often 90% or more. Democratic Party ballot choices are as follows. Republican Party ballot choices are as follows. The Constitution Party does not have two or more people running for any office, but, of course you may vote for any listed candidate, or write in a candidate. To make your vote count, you may vote only in the Democratic, Republican, or Constitution Party column. The voting tabulator will spit your ballot out if you try to vote in both columns, and you will have to get a second ballot. (The old one will be torn and kept by the election workers.) If you make a mistake like that a second time, a third ballot can be issued. The first circle to fill in is the party preference section: Democratic, Republican, or Constitution. Then proceed to that party’s section and make your choices. To see how the ballot actually looks, check out this webpage: http://www.city.fitchburg.wi.us/DocumentCenter/View/8335 It shows the Fitchburg ballots, but Madison ballots are basically the same. If you live in the Madison part of the neighborhood, you are lucky because the Madison polling location is right in the neighborhood at 4709 Verona Rd. It’s at the Dane County Parent Council building, on the Verona Frontage Road, 4709 Verona Road. That’s first building past MacDonald’s and Red Arrow Trail. It’s a low brown building with plenty of parking in front. Used to be a Pizza Hut many, many years ago. The Ward number is 76, Madison Alder District 10. Fitchburg residents probably have to get in a car, a taxi, or on a bike because your voting location is Fitchburg Fire Station #2 at 5415 King James Way. That is to the west of Verona Road out near PD/McKee Road, before you go up the hill to Aldi’s, Target, and HyVee. The District number is 1, and our neighborhood’s Fitchburg voters are in Ward 1. All four wards of District 1 vote at this location. It’s easy to find out which city you vote in. If you have a computer, simply go to https://myvote.wi.gov/Address/AddressSearchScreen.aspx <file://localhost/Address/AddressSearchScreen.aspx> Put in your house number, street name, and either Madison or Fitchburg. Madison will work even if you live in Fitchburg. Click Search. Your voting jurisdiction - Madison or Fitchburg - will come up along with your voting location and municipal clerk contact information. Call the clerk if you have any further questions. With the courts making decisions about various cases related to voter photo ID, you may be unsure whether you need it or not. Voter photo ID is NOT NEEDED. However, if you have changed your address since the last election, you will need to register at the polls. If you have moved since the last election and haven’t taken care of registering for your new address, you may register right at the voting location. In that case, you will need to take some documents to the polls. Take your Wisconsin driver’s license or Wisconsin photo ID if you possess one, or your Social Security number if you don’t have one of those two documents. You will have to write your driver’s license number or Wisconsin ID card number on the registration form. Your Social Security number is needed only if you do not own a Wisconsin driver’s licence or Wisconsin ID card. To register at the polling place, you will also need to prove what your current address is with an official document such as your driver’s licence or Wisconsin ID (that contanins your new address), a utility bill or lease in your name, a bank statement which you may show on your smart phone, or other similar items. The proof of residence must have your name and current address on it. You cannot use a personal letter or an advertisement sent to you. As usual, the neighborhood council meets at Prairie UU Society. As of this writing, we don’t have any special appearances scheduled, but will be planning the annual meeting of the Dunn’s Marsh Neighborhood Association. Join us for another great Ride the Drive Neighborhood event. This event will be held on August 24, 2014 on Madison's east side. Ride the Drive is a carefree, car free event that turns Madison’s signature streets into a public promenade that is open to cyclists, walkers, rollerbladers, and those out to share in the experience and fun atmosphere. These popular events bring 10,000 - 20,000 people out to ride, walk and skate on the route, enjoy live music, food, and participate in various activities, and fun stopping points along the way.